I’ve been doing some work with the Dun & Bradstreet Company Cleanse & Match offer in the Windows Azure Marketplace. 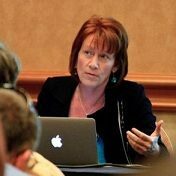 A common data quality scenario I encounter is the business need to create more complete customer (company) records for various business reasons (marketing, collection, etc…). Shown below is a sample of how this offer works. You can see that three records with different types and amounts of information have been combined into one completed record. You may also note that the D&B D-U-N-S number has been associated with the identified company. 1) The D&B business database is global, comprehensive and verified. 2) D&B uses a proprietary, powerful and configurable cleanse/match algorithm to correct, complete and de-duplicate records. 3) D&B offers flexibility in terms of integration with Microsoft APIs and Tools. 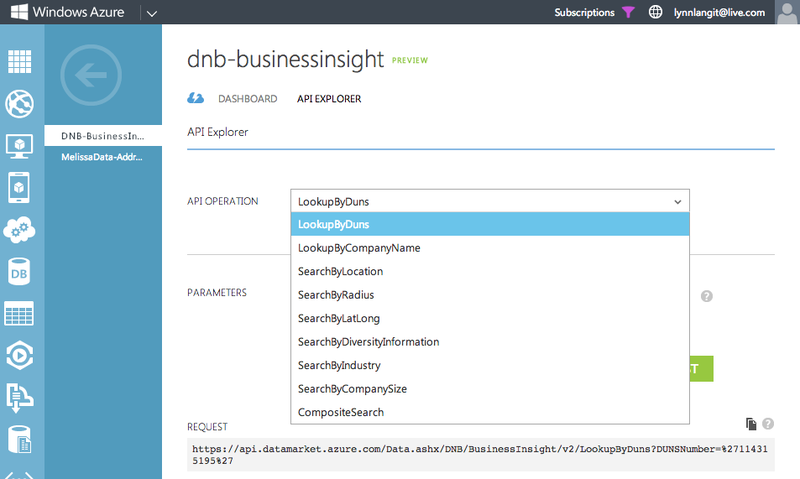 I’ve already blogged (and screencasted) about the integration between D&B Cleanse & Match and SQL Server 2012 Data Quality Services. In today’s blog, I’ll include information about working with SQL Server 2012 SSIS and about integration with PowerBI. Note: In addition to the D&B Cleanse & Match offer, D&B has several other offers in the Windows Azure Marketplace and also in the Windows Azure Store. For example, here is a screenshot of the integration of their ‘Business Insight’ offer from within the Windows Azure Store (in the Windows Azure portal). If you are at the SQL Pass Summit this week, be sure to stop by the D&B booth to get access to the preview SSIS component and to learn more about their many offers on the Windows Azure Marketplace. They are also running some fun contests (for cash!) at the show. 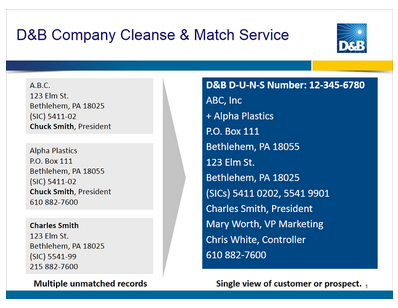 Below are a series of screencasts which show the integration between D&B Cleanse & Match and Microsoft products in greater detail. First is the SSIS component demo. Next is a series of 3 demos, which provide a detailed use case (creating a rich customer contact list for a growing business in a particular industry) using public data, PowerBI and D&B data and algorithms to produce a complete, validated, useful prospect list. In part two, I use PowerQuery and D&B data to create a targeted company contact list, with the attributes I value for this scenario (such as ‘green-certified’) and those that I’ve identified based on my earlier data research (such as which US States I was to focus on). In part three, I again use PowerQuery and D&B data to further enrich the prospect list, by adding actual contact information (names, email addresses and phone numbers) to produce an actionable prospect list for my marketing team. I also show the new Data Gateway (Eldorado) from Office 365. Are you interested in learning more? Check out this information page.